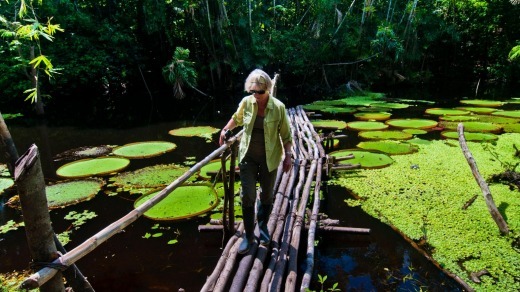 Anacondas to macaws, myths and fact, Kerry van der Jagt experiences the Amazon in river cruise luxury. There are two surprising things about anacondas, apart from the fact that they can probably swallow a human whole. The first is that they give birth to live young, as many as 40 at one time. The second is that it takes three men to carry one. I am introduced to this fun fact on the first day of my Amazon River cruise aboard the luxury riverboat the MV Aria. 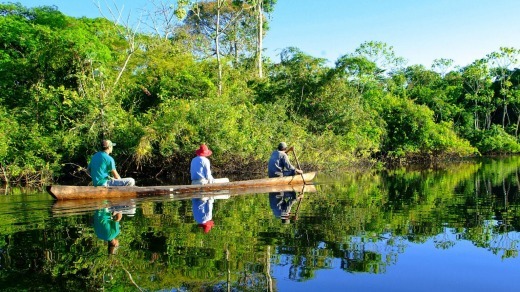 After an afternoon on the Pucate River, scouting for toucans and fishing for piranha we return to the Aria by skiff (tender) when our naturalist guide Daniel Vasquez spots a commotion on the riverbank. As curious as he is knowledgeable, Vasquez cuts the engine, bringing us alongside the water village where three hunched men appear to be shouldering a writhing log. Except it's not a log, but an anaconda, all five metres of hissing, spitting rage. Followed by a gaggle of squawking children, these reptile wranglers are relocating the predator away from their homes. "To the people living in the rainforest anacondas are the guardians of the lakes," says Vasquez. "They would no sooner harm one than their own mother." The respect these "riberenos" or river people show towards all jungle creatures, great and small, becomes the defining moment of my trip. The day before I'd boarded Aria in the Peruvian town of Nauta, in the region of Loreto in the upper Amazon. Though it is September and the low-water season, we arrive in the middle of a storm, scampering up the wooden gangplank like a mischief of drowned rats. "We get more than 250 days of rain each year," says Vasquez. "So our two seasons are rainy and not-so-rainy." 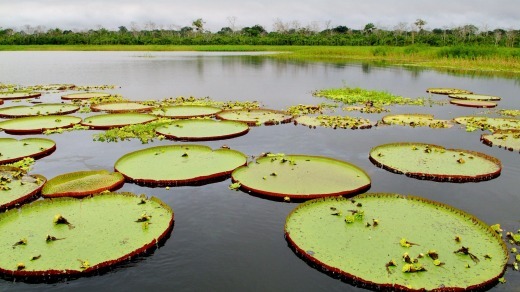 With an average discharge of 209, 000 cubic metres a second, the Amazon is the world's largest river by volume, trundling 6453 kilometres from its source in the Peruvian Andes to the Atlantic Ocean in Brazil. While these statistics are mind-boggling, it is the promise of wildlife that has attracted me. That and the spine-tingling sense of mystery – the possibility that the rainforest still harbours lost tribes or plants capable of curing cancer, and that it is supposedly home to mythical spirits such as El Chullachaqui, a dwarf-like guardian of the forest, who, according to local lore, can take on the form of loved ones and lure people away if they damage the forest. The MV Aria, an opulent riverboat owned by Aqua Expeditions and accommodating just 32 guests, sits above the coffee-coloured water like a contemporary art gallery of sharp lines and gleaming glass. I've joined the three-night cruise as part of a 16-day Peru and Amazon Cruising adventure with Scenic Tours, starting and finishing in Lima. Comprising mainly Australians, our small group of 24 has already bonded well, so we are delighted to find this sailing is exclusive to Scenic passengers. Having boarded in darkness I awake to a cathedral of green framed by a wall of glass, beads of condensation smearing the scene. If there's a greater juxtaposition of opposing elements, I'm yet to see it: primordial wilderness on one side, five-star luxury on the other. It is luxury that includes a menu designed by Pedro Miguel Schiaffino, one of Peru's finest chefs, Italian-designed bathrooms and thread counts in the hundreds. 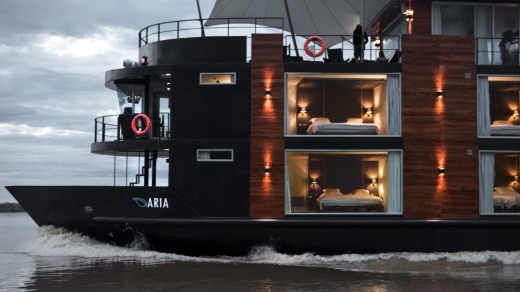 Custom built in 2011 by leading Peruvian architect Jordi Puig, the 16-cabin Aria has a small gym, indoor and outdoor lounge, bar and lecture theatre, observation deck, dining room, boutique and outdoor jacuzzi. But it's in the eight-person skiffs that we plunge headfirst into the world's biggest jungle. With four skiffs and four English-speaking naturalist guides between us, the twice-daily explorations are intimate. On our first morning we motor to Pacaya-Samiria National Reserve, a green triangle known as the Jungle of Mirrors, at the confluence of the Maranon and Ucayali rivers. 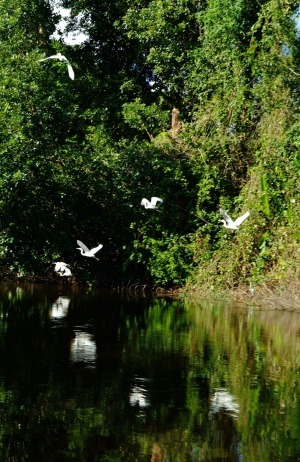 Home to the 213 villages, representing three tribal groups, as well as jaguars, manatees, black caiman, anacondas, giant otters, pink dolphins and 470 species of birds, the Belgium-sized reserve is one of the world's most diverse. Turning into the Pucate River, one of the Amazon's 11,000 tributaries, we cut the engine and float alongside a stand of palm trees. On the treetops we see a troupe of capuchin monkeys, all googly eyes and punk rock hairdos, whistling and gawking like mischievous teenagers. 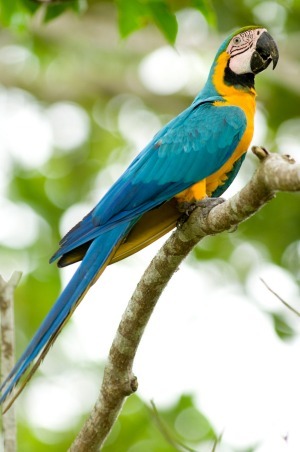 Other creatures gradually add colour and texture; a three-toed sloth, moving so slowly we are told algae grows on its coat, a flock of green kiskadees, fluttering like falling leaves and finally, blue-and-yellow macaws streaming across the sky. 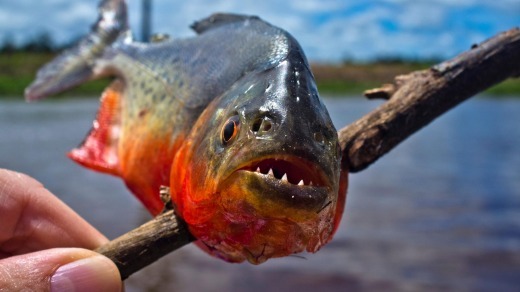 Pushing deeper into a black-water tributary, we stop to fish for piranha. "I hope no one is wearing sandals," Vasquez quips. "Otherwise you will do the piranha dance." Vasquez, who is from the Cocama tribe, an ethnic community three days upstream, is filled with such pearls of Amazonian wisdom. "Boys learn at an early age not to wee in the river," he says. "Tiny fish can swim back up the urine stream, even if you are standing on the river bank." While he shows us how to bait our simple rods he tells the story of how when he was eight years old his family left their home for Iquitos. "My dad wanted us to have opportunities, so he built a raft to carry all eight of us for the 15-day journey," he says. "But even after we moved my father kept teaching us everything he knew about the Amazon rainforest." Today Vasquez uses this same knowledge everyday, showing us how to tap the water's surface with the rod, and then yank it up when we feel a nibble. Within minutes I've landed a 15 centimetre, red-bellied piranha, with a gaping mouth and flesh-ripping teeth. After everyone catches enough to secure future bragging rights, which we toast with a round of Cusquena beer, we head back to the Aria for lunch, but not before our encounter with the anaconda. On another day we visit Puerto Prado village where local man Manu leads us on a hot and sweaty jungle walk. While pointing out medicinal plants (walking palm tree for fever, "iodine" leaf for cuts) and animals that kill (poison dart frog), Manu talks about the spirits in the jungle. "Every tree and creature has a spirit," he says. "Our myths have evolved to remind us to take care of the forest." Aqua Expeditions works with villages, the national park and the Taricaya Turtle Project helping to protect yellow-spotted river turtles by relocating vulnerable eggs to safe locations. "This season, with the help of our guests, we re-nested 5000 eggs," says Vasquez, during a talk on turtle conservation. We, too, will will visit the project and have a hands-on experience of moving 115 eggs. In future months other lucky guests will release the hatchlings back to the river. 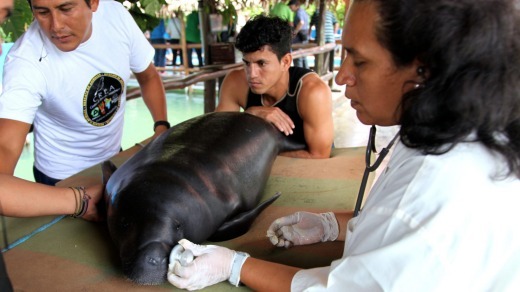 In total Aqua Expeditions works closely with 22 riverbank communities; sharing Aria's on-board medic to treat sick villagers, dispensing free medicines and providing information about the sustainable use of resources. While visiting Puerto Prado I'm befriended by two young girls, Jerry and Daly, whose little hands find mine as they show me their rickety timber home on stilts. These girls will most likely marry by age 15 and by age 20 will have a number of children each. Afterwards, Manu takes us to an azure backwater lake carpeted with giant water lilies, each one the width of a VW Beetle. Like Alice in Wonderland after sipping the "drink me" potion I feel myself shrinking. As I'm learning, nothing on the river is as it should be, even the word "giant"is superfluous in a place where lakes, snakes, snails and water lilies are Amazon-sized. 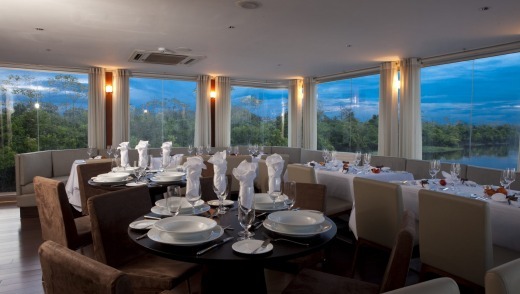 Back inside our glass bubble we dine on superb tasting menus, a fusion of forest food and haute cuisine, with 80 per cent of the food sourced from the jungle. There are cold hearts of palm cream soup, grilled jumbo crayfish with roasted cocona salsa, and coconut tapioca with mango salad. Served with these are regional breads, nutty and dense and flavoured with turmeric, sachaculantro and purple name. At other times we attend wildlife lectures, relax on the sundeck or stretch out in the jacuzzi sipping pisco sours. Robinson the barman gives a lesson in the art of making the perfect pisco sour, the national Peruvian cocktail. "It's all in the wrist," he says, showing us how to blend two parts Pisco Tabernero with one part lime juice and one part syrup. "Add a dozen ice cubes, egg white and SHAKE." Later that night Robinson joins Vasquez in the bar, strumming guitars and singing, together with Ivan the towel-art magician, one of the masseurs and a paramedic. With most of the staff calling the Amazon home, it feels like we have joined an extended family. 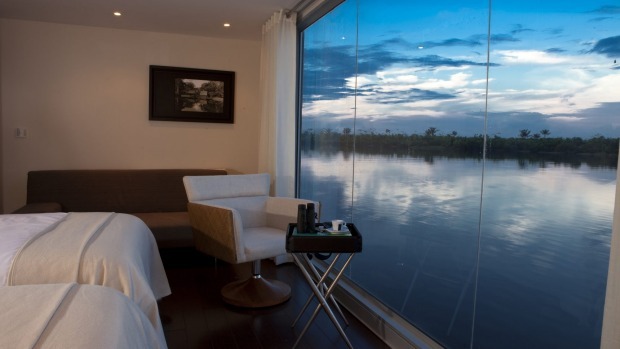 The attention to detail is outstanding – unexpected skiff stops for a surprise, champagne, cool flannels and a chilled camu camu juice when we step back on board, rooms serviced three times daily. 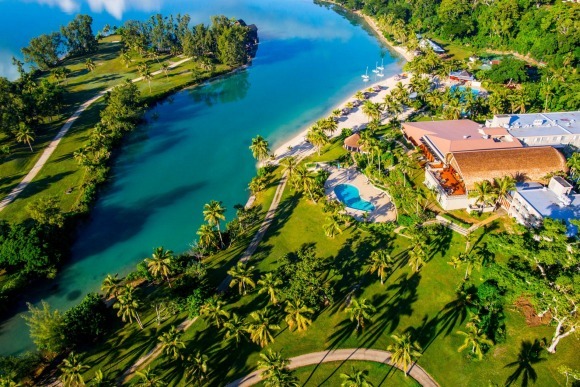 Not surprisingly, walking the line between wilderness and wanton luxury is an easy adjustment. During a morning lecture we learn that while the source of the Amazon has been hotly contested since the 1600s, it is generally agreed it begins life as a glacial stream, barely 30 centimetres wide, on a snow-capped peak in the Andes, in southern Peru. While the river goes by many names from here, it's not until the confluence of the Maranon and Ucayali rivers that it officially becomes the Amazon River. On our final day we cruise through the junction where celebrations were held when the Amazon joined the "New 7 Wonders of Nature" list in 2012. One afternoon, banishing thoughts of piranhas and anacondas, we brave a swim, not in the Amazon River, but in Clavero Lake. "Piranhas only like black water," Vasquez assures us. Puttering into the lake we are met by a platoon of dugout canoes, propelled by smiling villagers who not only invite us to join them in their vessels for a paddle, but also for a swim. With the setting sun turning the water to gold we laugh and splash, screaming when we think something has touched our toes. Gathered in the bar that night, one of the passengers shows us a photograph she took of us swimming. We can just make out the bulbous head of a bubble-gum pink dolphin bobbing behind our backs that at the time, no one saw. Over the four days I spot dozens of pink river dolphins, generally where the tannin-black tributaries bleeds into the brown Amazon, but I never manage to photograph one; I'd lift my camera and they would disappear, I'd put it away and they would jump up beside me. According to local lore pink dolphins, or botos as they are called, possess magical powers. Some say the elusive yet friendly creatures can form-change into handsome young men intent on seducing young maidens, others say they whisk away lone swimmers to a magical underwater city. One evening we set out in the skiffs for a night safari, gliding along the Nauta Cano Creek, before detouring into a narrow, flooded glade. Under the heaving, breathing, pulsing arch the water is a raven-coloured ribbon, punctuated regularly by the red jewelled eyes of caiman, picked out by the glow of our spotlight. Overhead, dense foliage blocks the inky sky, while a troop of fireflies hang like garlands of fairy lights. The only noise is the sluice of water, the flap of bat wings and a low whistle. "That whistle is El Tunchi," Vasquez whispers. "The spirit that reminds us to respect the jungle." 1. Amazon bass tiradito with cocona – sashimi style fillets are arranged on a shallow plate, seasoned with salt and served with a tiradito sauce of chillies, sachaculantro leaves, garlic, ginger and lime juice. 2. River snails with Amazon salsa – the giant river snails are simmered for one hour in white wine, garlic, ginger and fish stock and served with a salsa of red onion, chopped cocona, chilli, heirloom tomato and sachaculantro. 3. Camu camu juice – a refreshing blend of ripe camu camu (a jungle berry), which has been soaked in boiling water, strained and blended. Served chilled it is a perfect breakfast accompaniment or pick me up. 4. A box lunch of Amazonian spring rolls with camu camu dipping sauce – fresh rice wrappers filled with smoked local ham, river prawns, sachaculantro leaves, chilli and cocona slices. 5. Tiger catfish cebiche with cashew fruit and purple ñame – cubes of fresh tiger catfish with julienne strips of chilli, sachaculantro and red onion, served with a puree of cashew stalks and a lime juice sauce. 1. Relocating and burying river turtle eggs as part of the Taricaya turtle preservation programme. 2. Visiting the Amazon Rescue Centre near Iquitos to see the rehabilitation of manatees, sloths and river otters. Guests can handfeed baby manatees. 3. Buying school supplies, dental hygiene kits and fishing tools to hand out to small river communities. 4. Visiting a school at the tiny Puerto Prado village, attending a lesson and being invited inside a family home. LAN Airlines operates seven one-stop flights each week from Sydney to Santiago, Chile, with onward connections to Lima, Peru. Travellers from Melbourne can connect to their LAN Airlines flight to Santiago in Sydney. Scenic Tours 16-day Peru Adventure & Amazon Cruising, includes the World Heritage site of Machu Picchu, the Sacred Valley, Cuzco – the historical capital of the Inca Empire, and Lake Titicaca and the luxurious three-night cruise on the Amazon River. It costs from $12,995 a person twin share. Phone 1300 723 642, see scenictours.com.au.